A meeting on the results of 2018 was held at the National Karate Federation on December 26. 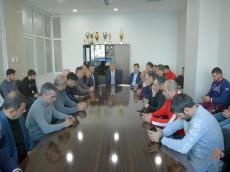 President of the Azerbaijani Karate FederationYashar Bashirov and other representatives of the federation congratulated the staff on their success. Speakers expressed their gratitude to President Ilham Aliyev for the attention and care for the development of sports, including karate in the country and the creation of conditions for athletes. Azerbaijani karatekas won 132 awards (29 gold, 38 silver and 47 bronze medals), world and European championships in various competitions, the premier league, series A and junior league competitions. Irina Zaretskaya became the first world champion among women, Rafael Agayev updated his medal record, Sahib Ahadov took second place in the world championships. According to other results, the karate masters increased their performance in world rankings. At the end of the year, one of the main members of the team, Ilaha Gasimova, received an apartment, which is an example of great attention to karatekas. It was noted that as a result of joint efforts with the Ministry of Youth and Sports, as well as with other organizations supporting the activities of the federation, the 2018 year was very successful for Azerbaijani karate. The crucial stage of the Tokyo-2020 Olympics begins. Employees of the federation stressed the importance of more serious preparation for the new year, saying that important work is being done in this direction. The captain of the team, Rafael Agayev, expressing gratitude on behalf of the athletes for the care shown to the karate players, said that he would try to continue his success in the upcoming season. The National Karate Federation was founded in 1994. In 1997, the National Federation became a full member of the World Karate Federation (WKF), the largest and most powerful karate organization in the world, comprising of 183 countries and more than 50 million members. A year earlier, the National Federation joined the European Karate Federation (EKF).